This amazing waterfall, actually a row of waterfalls, is a must see while in the Rocky Mountains in British Columbia. Located inside the Yoho National Park, accessible over a side road which is closed in winter. 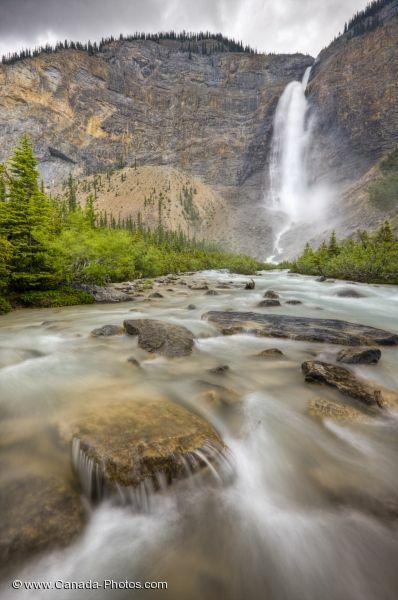 The Takakkaw Falls are 384 meters (1260 feet) high. Takakkaw Falls waterfall along the Yoho River in Yoho National Park, British Columbia, Canada. Please let me show you more of my pictures from my "photo gallery: waterfall pictures". Pictures from photo gallery "Waterfall Pictures"